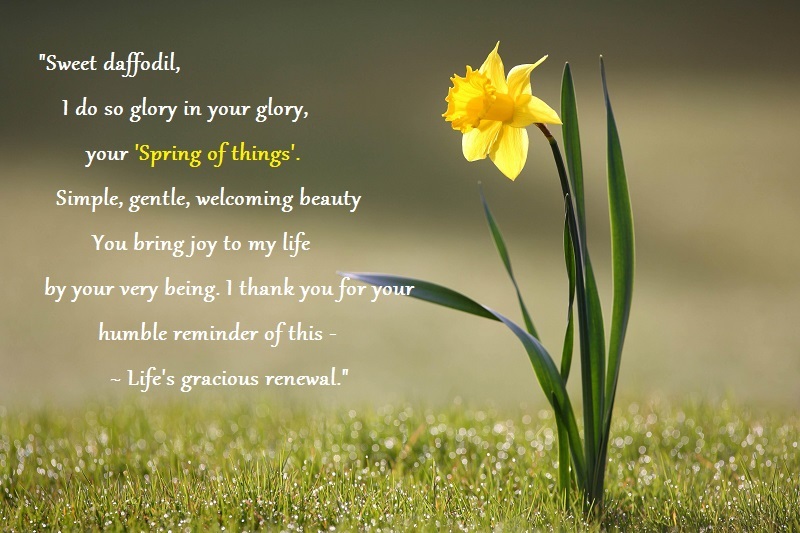 Sweet Daffodil – Reminder of Life’s Renewal! Here on the Northwestern end of America, the daffodils are blooming everywhere. Spring has arrived – yes! Everyone have an excellent weekend, with joy and gratitude in your heart for all that you have. This is my first daffodil sighting this year. I hope to see one around here soon. It’s sunny & in the 60s today – HOORAY! Lovely you have spring too! Enjoy the weekend and be thankful for so many things! Big hugs! Hi Dina. Thank you. Hoping your week started off well for you. A beautiful verse to a flower we adore but unfortunately some of ours are being battered by wind and Ellie’s tennis balls. Don’t fret we are used to it. Spring has finally sprung for you! Yahey!! Love this post Penny. Have a great weekend.